Hilltop turbines are being blamed for myriad maladies. What is the truth behind these outlandish claims? Simon Chapman debunks these claims in this article from the New Scientist. NEW technology has long attracted "modern health worries". Microwave ovens, television and computer screens and even early telephony all caused anxiety in their time. More recently, cellphones and towers, Wi-Fi and smart electricity meters have followed suit. Another is gathering attention; the very modern malaise known as wind turbine syndrome. I set out to collect the conditions attributed to wind farm exposure. Within hours, I'd found 50 often florid assertions about different illnesses. Today my total sits at 198, with a range redolent of Old Testament plagues. The list includes "deaths, yes, many deaths", none of which have ever come to the attention of a coroner, cancers, congenital malformations, and every manner of psychiatric problem. But mostly, it includes common health problems found in all communities, with wind turbines or not. These include greying hair, energy loss, concentration lapses, weight gain and all the problems of ageing. Sleep problems are mentioned most, but insomnia is incredibly common. Animals get a look in. Chickens won't lay; earthworms vanish; hundreds of cattle and goats die horrible deaths from "stray electricity". In a 35-year career in public health, I have never encountered anything quite so apocalyptic. I've visited wind farms and compared their gentle swoosh to the noises that all city dwellers live with daily. Quickly, this phenomenon began to tick psychogenic boxes. There are several reasons to suspect that the unrecognised entity of wind turbine syndrome is psychogenic: a "communicated" disease spread by anti-wind interest groups, sometimes with connections to fossil fuel interests. People can worry themselves sick. Firstly, there are the temporal problems. Wind farms appeared some 20 years ago in the US. There are now just shy of 200,000 turbines globally. But the first recorded claims that they caused disease came a decade later. Two rural doctors, one in the UK and the other in Australia, made claims repeated widely in newspapers but never published in any journal. Turbines have come to be blamed for chronic conditions like (amazingly) lung and skin cancer, diabetes, multiple sclerosis and stroke. But importantly also acute symptoms, that according to Australia's high priestess of wind turbine syndrome, Sarah Laurie, an unregistered doctor, can commence within 20 minutes of exposure. If true, what happened in the early complaint-free years? Then there's the issue of clustering. The European wind industry sees the phenomenon as largely anglophone, and even then, only in particular regions and around certain farms. Many sites have run for years without complaint. Others, legendary for their vocal opponents even before start up, are hot beds of disease claims. So if turbines were inherently noxious, why do they cut such a selective path? 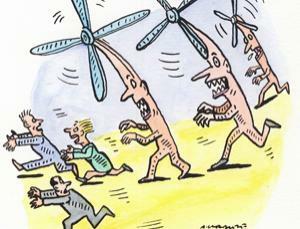 Why do citizens of community-owned turbines in Germany and Denmark rarely complain? Why are complaints rare in western Australia, but rife in several eastern Australian communities? It is clear the presence of these anti-wind "vectors" is required. Communities which have for years accepted the farms can erupt when activists arrive, spreading alarm and listing health problems. Prominent among these in Australia are wealthy conservative landowners appalled by the very visible presence of the tall green-energy totems, a constant reminder of bucolic decay and the "upstairs-downstairs" disdain they have for those needing income from their often hilly, poorer quality land. Wind companies also report residents approaching them with extensive renovation wish lists. One told me of a request for a house to be moved to a lake shore. In rural Australia, residential buy-outs by mining companies are common. Word spreads about shack owners who got lucky. So when a cashed-up company appears, it is understandable that some may see their ticket out via protracted complaints. Opponents also claim that confidentiality clauses are used to gag hosts, so they can't speak up about illnesses. I've seen several contracts and, predictably, none involve signing away common law rights to claims of negligence. Finally, there are the apocryphal tales about many families having to abandon their homes. Mysteriously, address lists are never produced. Abandoning unsaleable properties is a sad part of rural decay, a fact which seems to escape fly-in, fly-out climate change denialists. Previous modern health worries dissipated when the predicted health mayhem never emerged and the feared exotic agents became thoroughly familiar. Hysteria about cellphone towers had its heyday in the late 1990s, at least in Australia, but is rare today. With 17 reviews of the evidence on harm caused by wind farms consistent in their assessment of insignificant risk, how long can this one last? Simon Chapman is professor in public health at the University of Sydney, Australia. Find the original article here.